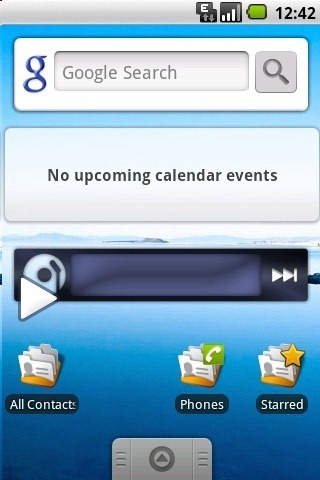 Today is a big day for Android, nay, for all of us. 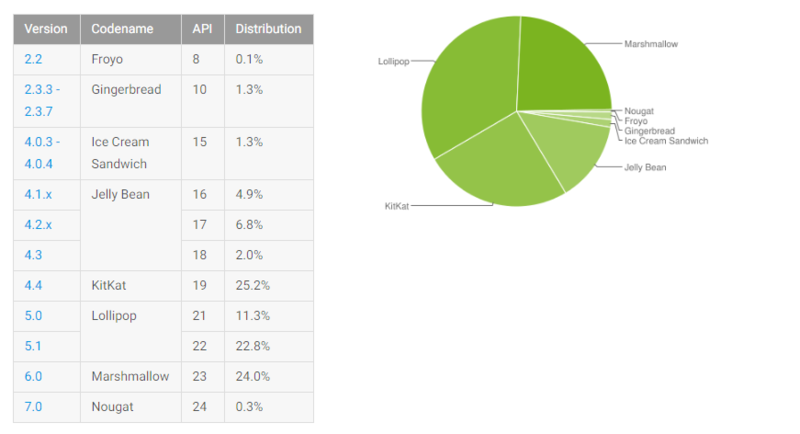 After nearly seven years, Android 2.2 Froyo has finally dropped off the platform distribution numbers. Our Froyo Deathwatch has ended. That's not all that happened this month, but everything else is fairly routine. 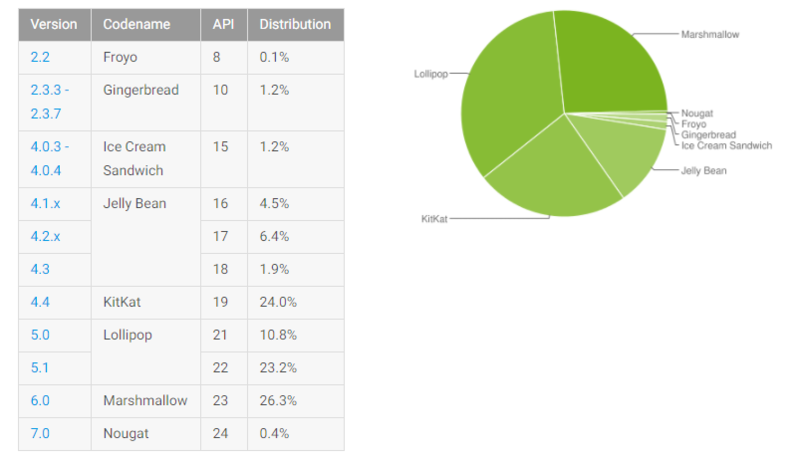 December's Android platform distribution numbers are up and... not much exciting has changed in the last month, to be honest. 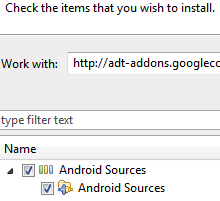 The only real milestone we're seeing is that Android 4.4 KitKat is finally no longer the most common API level of the platform, having been usurped by Android 6.0 Marshmallow. KitKat's dominant streak was around two years - let's hope Marshmallow doesn't sit on the throne that long. 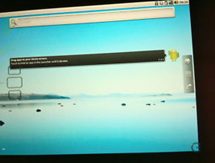 This does mean that the most common version of the platform is now only two API versions behind the most recent version (Android 7.1, API level 25). 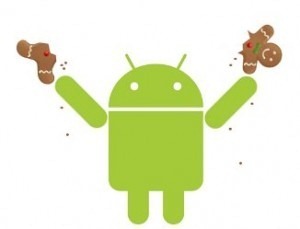 The reason KitKat was so long dominant is that Android 5.0 and 5.1 were split into two platform versions because of their differing API levels. Android platform distributions for the first week of November are up, and Nougat has appeared... with 0.3% of the pie. But it's there! The only other really noteworthy change came from Marshmallow, which surged 5.3 points to 24% of total devices. 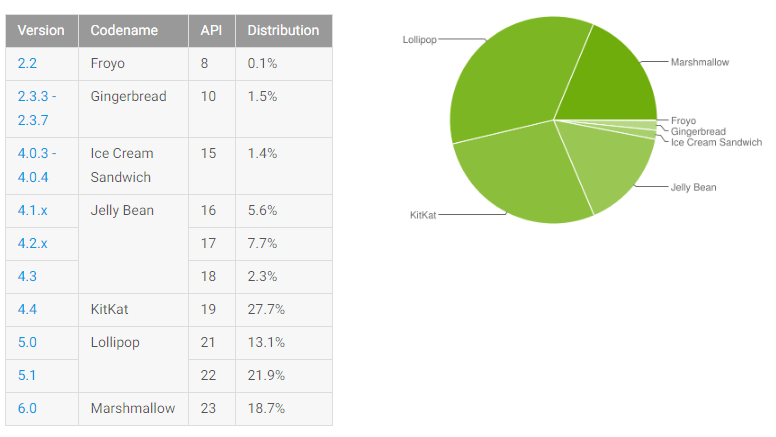 As such, it seems likely that Marshmallow will unseat KitKat as the most common version of the Android platform next month, at least if we're counting by API level. 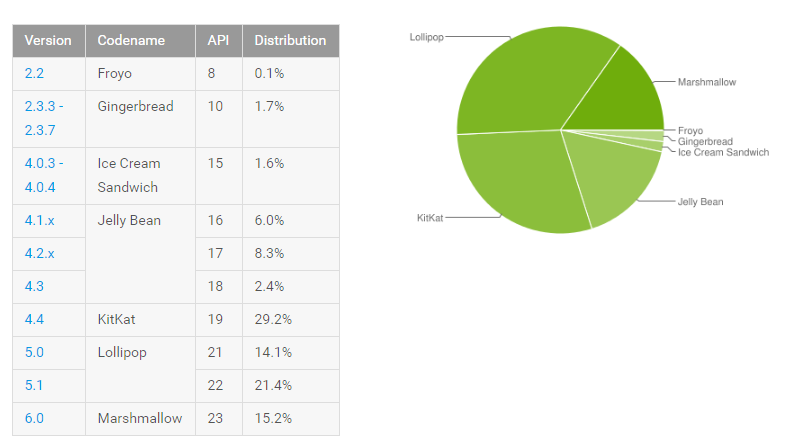 If you're counting by whole-digit version, Lollipop is in the lead, and has been for some time. But KitKat has held this position of dominance for, well, a really long time (probably around two years). 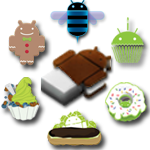 KitKat dropped 1.5 points, Jelly Bean (all versions) collectively dipped a meager 1.1 points, and Ice Cream Sandwich and Gingerbread barely budged from their previous positions.